Where have you gone, John McCain? One thing we knew about John McCain, he was a straight shooter. He said what he believed, he stood behind what he said. McCain voted for the Emergency Economic Stabilization Act of 2008 (popular name: the bank bailout), which passed both houses of Congress and was signed into law by President Bush on October 3, 2008. McCain was one of 74 senators voting for the bill. We were all misled [by Treasury secretary Paulson]. We were all misled. I mean, he said that they were going after the toxic assets. The toxic asset–his word–was the housing market. He testified to that. I mean, we were all misled. So what did he do then? They started pumping money into the financial institutions. Now the financial institutions are fine. Wall Street’s doing great. Main Street is in deep trouble. C’mon, Senator. The toxic assets—the underwater home mortgages—were held by the financial institutions. You knew then—everybody knew—that the money was to bail them out. Paulson didn’t mislead you. Nor did Bernanke. You voted for it to prevent a catastrophic collapse of the financial sector and with it, the world economy. You thought it was the right thing to do. 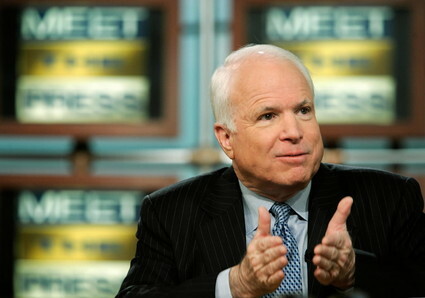 We liked the old McCain—the straight shooter, the truth teller—better. Wonder what happened to him. This entry was posted on March 1, 2010 at 11:28 pm and is filed under Politics. You can follow any responses to this entry through the RSS 2.0 feed. You can leave a response, or trackback from your own site. McCain is not the only ethics challenged member of his party. Over 90, yep ninety republicans have voted against the stimulus and then gone home and praised it for getting funds to their community. Here in MS, Gov. Barbour was adamantly against it, initially, but when a budget shortfall threatened the state budget, he found federal money. Where did he think the federal money came from? On another note, The tea party movement is correct in their frustration with how government works. However, I have noticed that they are completely uninformed which government programs effect them day to day. Federal funding supports: local fire and police departments, insures that the foods we eat are safe in the grocery stores and schools, regulates the safety of automobiles and consumer products, assists in building highways and bridges, provides support and health care to many older Americans, insuring that their banks do not fail, guaranteeing them the right to public assembly and the right to work, insuring the domestic tranquility, provide common defense, promote the general welfare and secure the blessing of liberty; whoops that last part quotes the Constitution. They want all the benefits, yet want to pay for none of them. Taxes are a necessary evil, but tea partyers are blind to the fact that big business is funding their movement. I like your summary of what the federal government does. I suspect that not very many people would want to do away with many of the things you mentioned.